Managed to get an invitation to last nights swanky event, after handing over £150 which went to the Cuban Medical Charity, so a very good cause, despite the hefty outlay. Was it worth it, absolutely and without question. A brilliantly organised event by Hunters and Frankau, held on the 28th Floor of the Park Lane Hilton. The welcoming reception was held in the cocktail lounge, adjacent to the Windows restaurant. For any who have been to Havana, the setting was very similar to the Tarquino nightclub on a similar floor level of the Habana Libre hotel, which was of course the Havana Hilton prior to the revolution. Bolivar Petit Coronas and Cohiba Exquisitos. I managed to grab a very nice Corona Gorda from Leonora, who is one of the top rollers @ the RYJ factory. There were the great and the good from the cigar world, Lords and Ladies, and just some ordinary guys like me who love the leaf and having a good time!! All the tables in the restaurant were named after different Bolivar vitolas, I was sat on the Royal Corona table, with 2 Lords, 2 big cheeses from H&F, Llewellyn from Dunhills in London, plus 2 other cigar connoisseurs. Attending the event was Mr Jose Fernandez de Cossio, the Cuban Ambassador to the Court of St.James. (London). Simon Chase as ever was the Master of Ceremonies, auctioneer... and probably had a few other functions as well. Simon told the guests after they had sat down, about the rules of the cigar tasting. The first cigar would be offered after the main course, and not as he put it the American way of smoking/herfing all the way through the meal. The first cigar was an Epicure 2, made in March this year, beautiful construction, flawless burn. It was a little young at first, but soon became a cigar that was difficult to put down. This cigar was served with Havana Club 7 year old rum. The second cigar served was a Trinidad Fundadore, made in 1999, from a 50 Cabinet. This was a beautiful smoke, and I must say in my experience I have NEVER had a bad Trinidad. this was served with a very special rum, Solera San Cristobal de La Habana 15 year old, this was almost perfection, the perfect rum for a cigar. 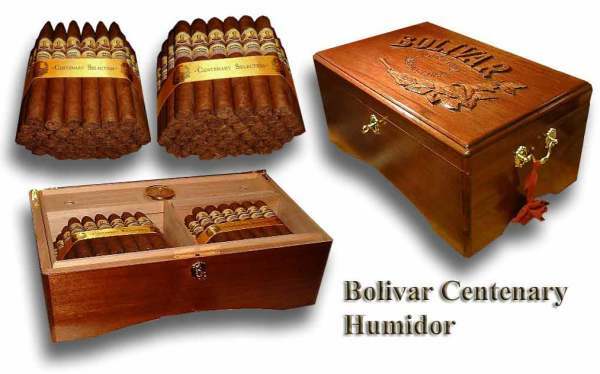 The third and final cigar served was of course a Bolivar Corona Gigantes Cabinet Selection. Always one of my favourite Churchills, my cigar was Bolivar heaven. The rum served with this was Havana Club 15 year old, an excellent choice, but not quite as good as the San Cristobal! During the smoking of the final cigar came various speeches, one by Nick Foulkes the journalist who writes under the name "Bolivar" in Country Life magazine. Then came the auction! On offer were 3 lots. 2. The first box in the country of Cohiba Siglo 6's, the next shipment will be earlyish next year. A beautiful looking cigar, these examples were a gorgeous Dark Colorado Maduro. This box went for £2,500!!!!! Then came 5 small lots of samples of Cohiba Siglo 6's, just one cigar at a time, although Mr James Suckling was given one to try out. Most sold for around £250 each!!! 3. This was a specially made Trinidad humidor, made to look like a 17th century Cuban house, so i believe. This contained 50 Fundadores and 50 Robusto A, which have been made before. This box was also signed by Fidel Castro. This went after some fierce bidding for £14,000!!! Then it was a Cuban bands turn, with some rather fit dancers, who manage to get me on the dance floor!! A magnificent event, which I thoroughly enjoyed, everyone was very nice indeed, and remarked what a wonderful evening it had been. A special vote of thanks go to Shaun Crowley and Jemma Freeman, and any others I've forgotten. Oh yes MO was there, in his finery, trying to get some of the lots in the auction, but even he drew a line.